Blood transfusion is the process of transferring blood or blood products into one's circulation intravenously. Transfusions are used for various medical conditions to replace lost components of the blood. Early transfusions used whole blood, but modern medical practice commonly uses only components of the blood, such as red blood cells, white blood cells, plasma, clotting factors, and platelets. Historically, red blood cell transfusion was considered when the hemoglobin level fell below 100 g/L or hematocrit fell below 30%. Because each unit of blood given carries risks, a trigger level lower than that, at 70 to 80 g/L, is now usually used, as it has been shown to have better patient outcomes. The administration of a single unit of blood is the standard for hospitalized people who are not bleeding, with this treatment followed with re-assessment and consideration of symptoms and hemoglobin concentration. Patients with poor oxygen saturation may need more blood. The advisory caution to use blood transfusion only with more severe anemia is in part due to evidence that outcomes are worsened if larger amounts are given. One may consider transfusion for people with symptoms of cardiovascular disease such as chest pain or shortness of breath. In cases where patients have low levels of hemoglobin due to iron deficiency, but are cardiovascularly stable, parenteral iron is a preferred option based on both efficacy and safety. Other blood products are given where appropriate, e.g., to treat clotting deficiencies. Blood transfusions use as sources of blood either one's own (autologous transfusion), or someone else's (allogeneic or homologous transfusion). The latter is much more common than the former. Using another's blood must first start with donation of blood. Blood is most commonly donated as whole blood intravenously and collecting it with an anticoagulant. In developed countries, donations are usually anonymous to the recipient, but products in a blood bank are always individually traceable through the whole cycle of donation, testing, separation into components, storage, and administration to the recipient. This enables management and investigation of any suspected transfusion related disease transmission or transfusion reaction. In developing countries the donor is sometimes specifically recruited by or for the recipient, typically a family member, and the donation occurs immediately before the transfusion. Donated blood is usually subjected to processing after it is collected, to make it suitable for use in specific patient populations. Collected blood is then separated into blood components by centrifugation: red blood cells, plasma, platelets, albumin protein, clotting factor concentrates, cryoprecipitate, fibrinogen concentrate, and immunoglobulins (antibodies). Red cells, plasma and platelets can also be donated individually via a more complex process called apheresis. The World Health Organization (WHO) recommends that all donated blood be tested for transfusion transmissible infections. These include HIV, Hepatitis B, Hepatitis C, Treponema pallidum (syphilis) and, where relevant, other infections that pose a risk to the safety of the blood supply, such as Trypanosoma cruzi (Chagas disease) and Plasmodium species (malaria). According to the WHO, 25 countries are not able to screen all donated blood for one or more of: HIV; Hepatitis B; Hepatitis C; or syphilis. One of the main reasons for this is because testing kits are not always available. However the prevalence of transfusion-transmitted infections is much higher in low income countries compared to middle and high income countries. All donated blood should also be tested for the ABO blood group system and Rh blood group system to ensure that the patient is receiving compatible blood. Leukocyte reduction is the removal of white blood cells by filtration. Leukoreduced blood products are less likely to cause HLA alloimmunization (development of antibodies against specific blood types), febrile non-hemolytic transfusion reaction, cytomegalovirus infection, and platelet-transfusion refractoriness. Pathogen Reduction treatment that involves, for example, the addition of riboflavin with subsequent exposure to UV light has been shown to be effective in inactivating pathogens (viruses, bacteria, parasites and white blood cells) in blood products. By inactivating white blood cells in donated blood products, riboflavin and UV light treatment can also replace gamma-irradiation as a method to prevent graft-versus-host disease (TA-GvHD). A positive screen warrants an antibody panel/investigation to determine if it is clinically significant. An antibody panel consists of commercially prepared group O red cell suspensions from donors that have been phenotyped for antigens that correspond to commonly encountered and clinically significant alloantibodies. Donor cells may have homozygous (e.g. K+k+), heterozygous (K+k-) expression or no expression of various antigens (K−k−). The phenotypes of all the donor cells being tested are shown in a chart. The patient's serum is tested against the various donor cells. Based on the reactions of the patient's serum against the donor cells, a pattern will emerge to confirm the presence of one or more antibodies. Not all antibodies are clinically significant (i.e. cause transfusion reactions, HDN, etc.). Once the patient has developed a clinically significant antibody it is vital that the patient receive antigen-negative red blood cells to prevent future transfusion reactions. A direct antiglobulin test (Coombs test) is also performed as part of the antibody investigation. Acute hemolytic reactions are defined according to Serious Hazards of Transfusion (SHOT) as "fever and other symptoms/signs of haemolysis within 24 hours of transfusion; confirmed by one or more of the following: a fall of Hb, rise in lactate dehydrogenase (LDH), positive direct antiglobulin test (DAT), positive crossmatch"  This is due to destruction of donor red blood cells by preformed recipient antibodies. Most often this occurs due to clerical errors or improper ABO blood typing and crossmatching resulting in a mismatch in ABO blood type between the donor and the recipient. Symptoms include fever, chills, chest pain, back pain, hemorrhage, increased heart rate, shortness of breath, and rapid drop in blood pressure. When suspected, transfusion should be stopped immediately, and blood sent for tests to evaluate for presence of hemolysis. Treatment is supportive. Kidney injury may occur due to the effects of the hemolytic reaction (pigment nephropathy). The severity of the transfusion reaction is depended upon amount of donor's antigen transfused, nature of the donor's antigens, the nature and the amount of recipient antibodies. Delayed hemolytic reactions occur more than 24 hours after a transfusion. They usually occur within 28 days of a transfusion. They can either be due to: a low level of antibodies present prior to the start of the transfusion, which are not detectable on pre-transfusion testing; or development of a new antibody against an antigen in the transfused blood. Therefore, delayed haemolytic reaction does not manifest until after 24 hours when enough amount of antibodies are available to cause a reaction. The red blood cells are removed by macrophages from the blood circulation into liver and spleen to be destroyed, which leads to extravascular haemolysis. This process usually mediated by anti-Rh and anti-Kidd antibodies. However, this type of transfusion reaction is less severe when compared to acute haemolytic transfusion reaction. Febrile nonhemolytic reactions are, along with allergic transfusion reactions, the most common type of blood transfusion reaction and occur due to the release of inflammatory chemical signals released by white blood cells in stored donor blood or attack on donor's white blood cells by recipient's antibodies. This type of reaction occurs in about 7% of transfusions. Fever is generally short lived and is treated with antipyretics, and transfusions may be finished as long as an acute hemolytic reaction is excluded. This is a reason for the now-widespread use of leukoreduction – the filtration of donor white cells from red cell product units. Allergic transfusion reactions are caused by IgE anti-allergen antibodies. When antibodies are bound to its antigens, histamine is released from mast cells and basophils. Either IgE antibodies from the donor's or recipient's side can cause the allergic reaction. It is more common in patients who have allergic conditions such as hay fever. Patient may feel itchy or having hives but the symptoms are usually mild and can be controlled by stopping the transfusion and giving antihistamines. Anaphylactic reactions are rare life-threatening allergic conditions caused by IgA anti-plasma protein antibodies. For patients who have selective immunoglobulin A deficiency, the reaction is presumed to be caused by IgA antibodies in the donor's plasma. The patient may present with symptoms of fever, wheezing, coughing, shortness of breath, and circulatory shock. Urgent treatment with epinephrine is needed. Post-transfusion purpura is an extremely rare complication that occurs after blood product transfusion and is associated with the presence of antibodies in the patient's blood directed against both the donor's and recipient's platelets HPA (human platelet antigen). Recipients who lack this protein develop sensitization to this protein from prior transfusions or previous pregnancies, can develop thrombocytopenia, bleeding into the skin, and can display purplish discolouration of skin which is known as purpura. Intravenous immunoglobulin (IVIG) is treatment of choice. Transfusion-associated acute lung injury (TRALI) is a syndrome that is similar to Acute respiratory distress syndrome (ARDS), which develops during or within 6 hours of transfusion of a plasma-containing blood product. Fever, hypotension, shortness of breath, and tachycardia often occurs in this type of reaction. For a definitive diagnosis to be made, symptoms must occur within 6 hours of transfusion, hypoxemia must be present, there must be radiographic evidence of bilateral infiltrates and there must be no evidence of left atrial hypertension (fluid overload). It occurs in 15% of the transfused patient with mortality rate of 5 to 10%. Recipient risk factors includes: end-stage liver disease, sepsis, haematological malignancies, sepsis, and ventilated patients. Antibodies to human Neutrophil Antigen's (HNA) and Human Leukocyte Antigens (HLA) have been associated with this type of transfusion reaction. Donor's antibodies interacting with antigen positive recipient tissue result in release of inflammatory cytokines, resulting in pulmonary capillary leakage. The treatment is supportive. Transfusion associated circulatory overload (TACO) is a common, yet underdiagnosed, reaction to blood product transfusion consisting of the new onset or exacerbation of three of the following within 6 hours of cessation of transfusion: acute respiratory distress, elevated brain natriuretic peptide (BNP), elevated central venous pressure (CVP), evidence of left heart failure, evidence of positive fluid balance, and/or radiographic evidence of pulmonary edema. Transfusion-associated graft versus host disease frequently occurs in immunodeficient patients where recipient's body failed to eliminate donor's T cells. Instead, donor's T cells attack the recipient's cells. It occurs one week after transfusion. Fever, rash, diarrhoea are often associated with this type of transfusion reaction. Mortality rate is high, with 89.7% of the patients died after 24 days. Immunosuppressive treatment is the most common way of treatment. Irradiation and leukoreduction of blood products is necessary for high risk patients for prevent T cells from attacking recipient cells. For red blood cells (RBC), by far the most commonly transfused product, poor transfusion efficacy can result from units damaged by the so-called storage lesion – a range of biochemical and biomechanical changes that occur during storage. With red cells, this can decrease viability and ability for tissue oxygenation. Although some of the biochemical changes are reversible after the blood is transfused, the biomechanical changes are less so, and rejuvenation products are not yet able to adequately reverse this phenomenon. There has been controversy about whether a given product unit's age is a factor in transfusion efficacy, specifically about whether "older" blood directly or indirectly increases risks of complications. Studies have not been consistent on answering this question, with some showing that older blood is indeed less effective but with others showing no such difference; these developments are being closely followed by hospital blood bankers – who are the physicians, typically pathologists, who collect and manage inventories of transfusable blood units. Certain regulatory measures are in place to minimize RBC storage lesion – including a maximum shelf life (currently 42 days), a maximum auto-hemolysis threshold (currently 1% in the US, 0.8% in Europe), and a minimum level of post-transfusion RBC survival in vivo (currently 75% after 24 hours). However, all of these criteria are applied in a universal manner that does not account for differences among units of product. For example, testing for the post-transfusion RBC survival in vivo is done on a sample of healthy volunteers, and then compliance is presumed for all RBC units based on universal (GMP) processing standards (of course, RBC survival by itself does not guarantee efficacy, but it is a necessary prerequisite for cell function, and hence serves as a regulatory proxy). Opinions vary as to the "best" way to determine transfusion efficacy in a patient in vivo. In general, there are not yet any in vitro tests to assess quality or predict efficacy for specific units of RBC blood product prior to their transfusion, though there is exploration of potentially relevant tests based on RBC membrane properties such as erythrocyte deformability and erythrocyte fragility (mechanical). A known relationship between intra-operative blood transfusion and cancer recurrence has been established in colorectal cancer. In lung cancer intra-operative blood transfusion has been associated with earlier recurrence of cancer, worse survival rates and poorer outcomes after lung resection. Also studies shown to us[who? ], failure of the immune system caused by blood transfusion can be categorized as one of the main factors leading to more than 10 different cancer types that are fully associated with blood transfusion and the innate and adaptive immune system. Allogeneic blood transfusion, through five major mechanisms including the lymphocyte-T set, myeloid-derived suppressor cells (MDSCs), tumor-associated macrophages (TAMs), natural killer cells (NKCs), and dendritic cells (DCs) can help the recipient's defense mechanisms. On the other hand, the role for each of the listed items includes activation of the antitumor CD8+ cytotoxic T lymphocytes (CD8+/CTL), temporal inactivation of Tregs, inactivation of the STAT3 signaling pathway, the use of bacteria to enhance the antitumor immune response and cellular Immunotherapy. Blood doping is often used by athletes, drug addicts or military personnel for reasons such as to increase physical stamina, to fake a drug detection test or simply to remain active and alert during the duty-times respectively. However a lack of knowledge and insufficient experience can turn a blood transfusion into a sudden death. For example, when individuals run the frozen blood sample directly in their veins this cold blood rapidly reaches the heart, where it disturbs the heart's original pace leading to cardiac arrest and sudden death. Beginning with William Harvey's experiments on the circulation of blood, research into blood transfusion began in the 17th century, with successful experiments in transfusion between animals. However, successive attempts by physicians to transfuse animal blood into humans gave variable, often fatal, results. Pope Innocent VIII is sometimes said to have been given "the world's first blood transfusion" by his Jewish physician Giacomo di San Genesio, who had him drink (by mouth) the blood of three 10-year-old boys. The boys subsequently died. The evidence for this story, however, is unreliable and may have been motivated by anti-semitism. Richard Lower pioneered the first blood transfusion from animal to human in 1665 at the Royal Society. Working at the Royal Society in the 1660s, the physician Richard Lower began examining the effects of changes in blood volume on circulatory function and developed methods for cross-circulatory study in animals, obviating clotting by closed arteriovenous connections. The new instruments he was able to devise enabled him to perform the first reliably documented successful transfusion of blood in front of his distinguished colleagues from the Royal Society. The first blood transfusion from animal to human was administered by Dr. Jean-Baptiste Denys, eminent physician to King Louis XIV of France, on June 15, 1667. He transfused the blood of a sheep into a 15-year-old boy, who survived the transfusion. Denys performed another transfusion into a labourer, who also survived. Both instances were likely due to the small amount of blood that was actually transfused into these people. This allowed them to withstand the allergic reaction. Denys' third patient to undergo a blood transfusion was Swedish Baron Gustaf Bonde. He received two transfusions. After the second transfusion Bonde died. In the winter of 1667, Denys performed several transfusions on Antoine Mauroy with calf's blood. On the third account Mauroy died. James Blundell, successfully transfused human blood in 1818. The science of blood transfusion dates to the first decade of the 20th century, with the discovery of distinct blood types leading to the practice of mixing some blood from the donor and the receiver before the transfusion (an early form of cross-matching). In the early 19th century, British obstetrician Dr. James Blundell made efforts to treat hemorrhage by transfusion of human blood using a syringe. In 1818 following experiments with animals, he performed the first successful transfusion of human blood to treat postpartum hemorrhage. Blundell used the patient's husband as a donor, and extracted four ounces of blood from his arm to transfuse into his wife. During the years 1825 and 1830, Blundell performed 10 transfusions, five of which were beneficial, and published his results. He also invented a number of instruments for the transfusion of blood. He made a substantial amount of money from this endeavour, roughly $2 million ($50 million real dollars). In 1840, at St George's Hospital Medical School in London, Samuel Armstrong Lane, aided by Dr. Blundell, performed the first successful whole blood transfusion to treat haemophilia. Work to emulate James Blundell continued in Edinburgh. In 1845 the Edinburgh Journal described the successful transfusion of blood to a woman with severe uterine bleeding. Subsequent transfusions were successful with patients of Professor James Young Simpson after whom the Simpson Memorial Maternity Pavilion in Edinburgh was named. The largest series of early successful transfusions took place at the Edinburgh Royal Infirmary between 1885 and 1892. Edinburgh later became the home of the first blood donation and blood transfusion services. William Stewart Halsted, M.D., performed one of the first blood transfusions in the United States. It was not until 1901, when the Austrian Karl Landsteiner discovered three human blood groups (O, A, and B), that blood transfusion was put onto a scientific basis and became safer. Landsteiner discovered that adverse effects arise from mixing blood from two incompatible individuals. He found that when incompatible types are mixed, an immune response is triggered and the red blood cells clump. The immunological reaction occurs when the receiver of a blood transfusion has antibodies against the donor blood cells. The destruction of red blood cells releases free hemoglobin into the bloodstream, which can have fatal consequences. Landsteiner's work made it possible to determine blood group and allowed a way for blood transfusions to be carried out much more safely. For this discovery he was awarded the Nobel Prize in Physiology and Medicine in 1930, and many other blood groups have been discovered since. Jan Janský also discovered the human blood groups in 1907 which he classified blood into four groups I, II, III, IV. Titled in Czech "Hematologická studie u psychotiků". His nomenclature is still used in Russia and states of the former USSR, in which blood types O, A, B, and AB are respectively designated I, II, III, and IV. William Stewart Halsted, M.D. (September 23, 1852 – September 7, 1922) was an American surgeon who emphasized strict aseptic technique during surgical procedures, was an early champion of newly discovered anesthetics, and introduced several new operations, including the radical mastectomy for breast cancer. Halsted returned to New York in 1880 and for the next six years led an extraordinarily vigorous and energetic life. He operated at multiple hospitals, including Roosevelt Hospital, the College of Physicians and Surgeons, Charity Hospital, Emigrant Hospital, Bellevue Hospital and Chambers Street Hospital. He was an extremely popular, inspiring and charismatic teacher. In 1882 he performed one of the first gallbladder operations in the United States (a cholecystotomy performed on his mother on the kitchen table at 2 am). Halsted also performed one of the first blood transfusions in the United States. He had been called to see his sister after she had given birth. He found her moribund from blood loss, and in a bold move withdrew his own blood, transfused his blood into his sister, and then operated on her to save her life. While the first transfusions had to be made directly from donor to receiver before coagulation, it was discovered that by adding anticoagulant and refrigerating the blood it was possible to store it for some days, thus opening the way for the development of blood banks. John Braxton Hicks was the first to experiment with chemical methods to prevent the coagulation of blood at St Mary's Hospital, London in the late 19th century. His attempts, using phosphate of soda, however, were unsuccessful. The first non-direct transfusion was performed on March 27, 1914 by the Belgian doctor Albert Hustin, though this was a diluted solution of blood. The Argentine doctor Luis Agote used a much less diluted solution in November of the same year. Both used sodium citrate as an anticoagulant. The First World War acted as a catalyst for the rapid development of blood banks and transfusion techniques. Canadian doctor and Lieutenant Lawrence Bruce Robertson was instrumental in persuading the Royal Army Medical Corps to adopt the use of blood transfusion at the Casualty Clearing Stations for the wounded. In October 1915, Robertson performed his first wartime transfusion with a syringe to a patient suffering from multiple shrapnel wounds. He followed this up with four subsequent transfusions in the following months and his success was reported to Sir Walter Morley Fletcher, director of the Medical Research Committee. 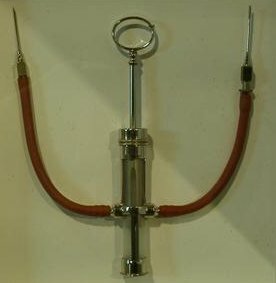 World War II Russian syringe for direct inter-human blood transfusion. Oswald Hope Robertson, a medical researcher and U.S. Army officer was attached to the RAMC in 1917, where he was instrumental in establishing the first blood banks, in preparation for the anticipated Third Battle of Ypres. He used sodium citrate as the anticoagulant and the blood was extracted from punctures in the vein and was stored in bottles at British and American Casualty Clearing Stations along the Front. He also experimented with preserving separated red blood cells in iced bottles. Geoffrey Keynes, a British surgeon, developed a portable machine that could store blood to enable transfusions to be carried out more easily. Alexander Bogdanov established a scientific institute to research the effects of blood transfusion in Moscow, 1925. The world's first blood donor service was established in 1921 by the secretary of the British Red Cross, Percy Oliver. In that year, Oliver was contacted by King's College Hospital, where they were in urgent need of a blood donor. After providing a donor, Oliver set about organizing a system for the voluntary registration of blood donors at clinics around London, with Sir Geoffrey Keynes appointed as a medical adviser. Volunteers were subjected to a series of physical tests to establish their blood group. The London Blood Transfusion Service was free of charge and expanded rapidly in its first few years of operation. By 1925, it was providing services for almost 500 patients and it was incorporated into the structure of the British Red Cross in 1926. Similar systems were established in other cities including Sheffield, Manchester and Norwich, and the service's work began to attract international attention. Similar services were established in France, Germany, Austria, Belgium, Australia and Japan. An academic institution devoted to the science of blood transfusion was founded by Alexander Bogdanov in Moscow in 1925. Bogdanov was motivated, at least in part, by a search for eternal youth, and remarked with satisfaction on the improvement of his eyesight, suspension of balding, and other positive symptoms after receiving 11 transfusions of whole blood. Bogdanov died in 1928 as a result of one of his experiments, when the blood of a student suffering from malaria and tuberculosis was given to him in a transfusion. Following Bogdanov's lead, Vladimir Shamov and Sergei Yudin in the USSR pioneered the transfusion of cadaveric blood from recently deceased donors. Yudin performed such a transfusion successfully for the first time on March 23, 1930 and reported his first seven clinical transfusions with cadaveric blood at the Fourth Congress of Ukrainian Surgeons at Kharkiv in September. However, this method was never used widely, even in Russia. In 1937 Bernard Fantus, director of therapeutics at the Cook County Hospital in Chicago, established the first hospital blood bank in the United States. In creating a hospital laboratory that preserved, refrigerated and stored donor blood, Fantus originated the term "blood bank". Within a few years, hospital and community blood banks were established across the United States. Wounded soldier is given blood plasma in Sicily, 1943. A blood collection program was initiated in the US in 1940 and Edwin Cohn pioneered the process of blood fractionation. He worked out the techniques for isolating the serum albumin fraction of blood plasma, which is essential for maintaining the osmotic pressure in the blood vessels, preventing their collapse. The use of blood plasma as a substitute for whole blood and for transfusion purposes was proposed as early as 1918, in the correspondence columns of the British Medical Journal, by Gordon R. Ward. At the onset of World War II, liquid plasma was used in Britain. A large project, known as 'Blood for Britain' began in August 1940 to collect blood in New York City hospitals for the export of plasma to Britain. A dried plasma package was developed, which reduced breakage and made the transportation, packaging, and storage much simpler. Charles R. Drew oversaw the production of blood plasma for shipping to Britain during WW2. The resulting dried plasma package came in two tin cans containing 400 mL bottles. One bottle contained enough distilled water to reconstitute the dried plasma contained within the other bottle. In about three minutes, the plasma would be ready to use and could stay fresh for around four hours. Dr. Charles R. Drew was appointed medical supervisor, and he was able to transform the test tube methods into the first successful technique for mass production. Another important breakthrough came in 1939–40 when Karl Landsteiner, Alex Wiener, Philip Levine, and R.E. Stetson discovered the Rhesus blood group system, which was found to be the cause of the majority of transfusion reactions up to that time. Three years later, the introduction by J.F. Loutit and Patrick L. Mollison of acid–citrate–dextrose (ACD) solution, which reduced the volume of anticoagulant, permitted transfusions of greater volumes of blood and allowed longer term storage. Carl Walter and W.P. Murphy Jr. introduced the plastic bag for blood collection in 1950. Replacing breakable glass bottles with durable plastic bags made from PVC allowed for the evolution of a collection system capable of safe and easy preparation of multiple blood components from a single unit of whole blood. A massive transfusion protocol is used when significant blood loss is present such as in major trauma, when more than ten units of blood are needed. Packed red blood cells, fresh frozen plasma, and platelets are generally administered. Typically higher ratios of fresh frozen plasma and platelets are given relative to packed red blood cells. Because blood type O negative is compatible with anyone, it is often overused and in short supply. According to the American Association of Blood Banks, the use of this blood should be restricted to persons with O negative blood, as nothing else is compatible with them, and women who might be pregnant and for whom it would be impossible to do blood group testing before giving them emergency treatment. Whenever possible, the AABB recommends that O negative blood be conserved by using blood type testing to identify a less scarce alternative. Jehovah's Witnesses object to blood transfusions due to their belief that blood is sacred. Although there are clinical situations where transfusion with red blood cells is the only clinically appropriate option, clinicians look at whether alternatives as feasible. This can be due to several reasons, such as patient safety, economic burden or scarcity of blood. Guidelines recommend blood transfusions should be reserved for patients with or at risk of cardiovascular instability due to the degree of their anaemia. In these cases parenteral iron is recommended. Thus far, there are no available oxygen-carrying blood substitutes, which is the typical objective of a blood (RBC) transfusion; however, there are widely available non-blood volume expanders for cases where only volume restoration is required. These are helping doctors and surgeons avoid the risks of disease transmission and immune suppression, address the chronic blood donor shortage, and address the concerns of Jehovah's Witnesses and others who have religious objections to receiving transfused blood. A number of blood substitutes have been explored (and still are), but thus far they all suffer from many challenges. Most attempts to find a suitable alternative to blood thus far have concentrated on cell-free hemoglobin solutions. Blood substitutes could make transfusions more readily available in emergency medicine and in pre-hospital EMS care. If successful, such a blood substitute could save many lives, particularly in trauma where massive blood loss results. Hemopure, a hemoglobin-based therapy, is approved for use in South Africa. Minor blood transfusions are used by a minority of nyaope drug addicts in South Africa to economically share the high the drug induces in a practice colloquially known as Bluetoothing, named after the wireless technology of the same name. ^ Carson, Jeffrey L.; Stanworth, Simon J.; Roubinian, Nareg; Fergusson, Dean A.; Triulzi, Darrell; Doree, Carolyn; Hebert, Paul C. (2016-10-12). "Transfusion thresholds and other strategies for guiding allogeneic red blood cell transfusion". The Cochrane Database of Systematic Reviews. 10: CD002042. doi:10.1002/14651858.CD002042.pub4. ISSN 1469-493X. PMC 4171966. PMID 27731885. ^ Gasche, C; Berstad, A; Befrits, R; Beglinger, C; Dignass, A; Erichsen, K; Gomollon, F; Hjortswang, H; Koutroubakis, I; Kulnigg, S; Oldenburg, B; Rampton, D; Schroeder, O; Stein, J; Travis, S; Van Assche, G (2007). "Guidelines on the diagnosis and management of iron deficiency and anemia in inflammatory bowel diseases" (PDF). Inflammatory Bowel Diseases. 13 (12): 1545–53. doi:10.1002/ibd.20285. PMID 17985376. ^ "Blood safety and availability". World Health Organization. June 2014. Retrieved 22 August 2014. ^ Screening donated blood for transfusion-transmissible infections: recommendations (PDF). World Health Organization. 2009. ISBN 978 92 4 154788 8. ^ a b c "Blood safety and availability Fact sheet 279". World Health Organization. Retrieved 21 January 2016. ^ "Testing of donated blood". World Health Organization. Retrieved 21 January 2016. ^ "Bacterial Detection Testing by Blood and Blood Collection Establishments and Transfusion Services to Enhance the Safety and Availability of Platelets for Transfusion". FDA U.S. Food and Drug Administration. Retrieved 21 January 2016. ^ Ziemann, Malte; Hennig, Holger (2014-02-01). "Prevention of Transfusion-Transmitted Cytomegalovirus Infections: Which is the Optimal Strategy?". Transfusion Medicine and Hemotherapy: Offizielles Organ der Deutschen Gesellschaft Fur̈ Transfusionsmedizin und Immunham̈atologie. 41 (1): 40–44. doi:10.1159/000357102. ISSN 1660-3796. PMC 3949610. PMID 24659946. ^ Hardwick, CC; Herivel, TR; Hernandez, SC; Ruane, PH; Goodrich, RP (2004). "Separation, Identification and Quantification of Riboflavin and Its Photoproducts in Blood Products Using High-Performance Liquid Chromatography With Fluorescence Detection: A Method to Support Pathogen Reduction Technology". Photochemistry and Photobiology. 80 (3): 609–615. doi:10.1562/0031-8655(2004)080<0609:TNSIAQ>2.0.CO;2. ISSN 0031-8655. PMID 15382964. ^ Blood Processing. University of Utah. Available at: http://library.med.utah.edu/WebPath/TUTORIAL/BLDBANK/BBPROC.html. Accessed on: December 15, 2006. ^ "WHO | Haemovigilance". Who.int. 2013-06-25. Retrieved 2013-12-11. ^ "SHOT Terms of Reference". Shotuk.org. Retrieved 22 August 2014. ^ Bolton-Maggs, PHB; Poles, D; et al. (Serious Hazards of Transfusion (SHOT) Steering Group) (2015). The 2014 Annual SHOT Report (2015) (PDF). SHOT. ISBN 978-0-9558648-7-2. Archived from the original (PDF) on 2016-01-27. Retrieved 2016-01-21. ^ a b c d e f g h i Laura, Dean (2005). Blood Groups and Red Cell Antigens. Bethesda, United States: National Center for Biotechnology Information. Retrieved 4 October 2017. ^ "The 2011 National Blood Collection and Utilization Survey Report" (PDF). Department of Health and Human Services. Retrieved 21 January 2016. ^ Murphy, M (2013). "Post-transfusion purpura". In Murphy, M; Pamphilon, D; Heddle, N. Practical Transfusion Medicine (4th ed.). Wiley-Blackwell. pp. 127–30. ^ a b "NHSN | CDC". www.cdc.gov. 2017-12-29. Retrieved 2018-09-18. ^ Kim, Jeongmin; Na, Sungwon (30 March 2015). "Transfusion-related acute lung injury; clinical perspectives". Korean Journal of Anaesthesiology. 68 (2): 101–105. doi:10.4097/kjae.2015.68.2.101. PMC 4384395. PMID 25844126. ^ Rohde, Jeffrey M.; Dimcheff, Derek E.; Blumberg, Neil; Saint, Sanjay; Langa, Kenneth M.; Kuhn, Latoya; Hickner, Andrew; Rogers, Mary A. M. (2 April 2014). "Health Care–Associated Infection After Red Blood Cell Transfusion". JAMA. 311 (13): 1317–26. doi:10.1001/jama.2014.2726. PMC 4289152. PMID 24691607. ^ Frank, SM; Abazyan, B; Ono, M; Hogue, CW; Cohen, DB; Berkowitz, DE; Ness, PM; Barodka, VM (2013). "Decreased erythrocyte deformability after transfusion and the effects of erythrocyte storage duration". Anesthesia and Analgesia. 116 (5): 975–81. doi:10.1213/ANE.0b013e31828843e6. PMC 3744176. PMID 23449853. ^ Barshtein G, Gural A, Manny N, Zelig O, Yedgar S, Arbell D (June 2014). "Storage-induced damage to red blood cell mechanical properties can be only partially reversed by rejuvenation". Transfus Med Hemother. 41 (3): 197–204. doi:10.1159/000357986. PMC 4086768. PMID 25053933. ^ Bakalar, Nicholas (2013-03-11). "The Shelf Life of Donor Blood". The New York Times. ^ Wang, Shirley S. (2009-12-01). "What's the Shelf Life of Blood?". The Wall Street Journal. ^ Aubron, Cécile; Nichol, Alistair; Cooper, D Jamie; Bellomo, Rinaldo (2013). "Age of red blood cells and transfusion in critically ill patients". Annals of Intensive Care. 3 (1): 2. doi:10.1186/2110-5820-3-2. PMC 3575378. PMID 23316800. ^ Hod, EA; Zhang, N; Sokol, SA; Wojczyk, BS; Francis, RO; Ansaldi, D; Francis, KP; Della-Latta, P; Whittier, S; Sheth, S; Hendrickson, JE; Zimring, JC; Brittenham, GM; Spitalnik, SL (2010). "Transfusion of red blood cells after prolonged storage produces harmful effects that are mediated by iron and inflammation". Blood. 115 (21): 4284–92. doi:10.1182/blood-2009-10-245001. PMC 2879099. PMID 20299509. ^ Pape, A; Stein, P; Horn, O; Habler, O (2009). "Clinical evidence of blood transfusion effectiveness". Blood Transfusion. 7 (4): 250–258. doi:10.2450/2008.0072-08. PMC 2782802. PMID 20011636. ^ "Easy does it—showing caution with RBC transfusions". College of American Pathologists. April 2009. Retrieved 22 August 2014. ^ Cata, JP; Wang, H; Gottumukkala, V; Reuben, J; Sessler, DI (May 2013). "Inflammatory response, immunosuppression, and cancer recurrence after perioperative blood transfusions". British Journal of Anaesthesia. 110 (5): 690–701. doi:10.1093/bja/aet068. PMC 3630286. PMID 23599512. ^ Churchhouse, AM; Mathews, TJ; McBride, OM; Dunning, J (Jan 2012). "Does blood transfusion increase the chance of recurrence in patients undergoing surgery for lung cancer?". Interactive Cardiovascular and Thoracic Surgery. 14 (1): 85–90. doi:10.1093/icvts/ivr025. PMC 3420304. PMID 22108935. ^ Kormi, Seyed Mohammad Amin; Seghatchian, Jerard (May 2017). "Taming the Immune System Through Transfusion in Oncology Patients". Transfusion and Apheresis Science. 56 (3): 310–316. doi:10.1016/j.transci.2017.05.017. PMID 28651910. Retrieved 26 May 2017. ^ Wald, Matthew L. (2014-08-24). "Blood Industry Shrinks as Transfusions Decline". New York Times Newspaper (Web Edition). New York Times. New York Times. Retrieved 2014-08-24. ^ a b A. M. Rivera; K. W. S. Trauss; A.Van Zundert; E. Mortier (2005). "The history of peripheral intravenous catheters : How little plastic tubes revolutionized medicine" (PDF). Acta Anaesthesiologica Belgica. Archived from the original (PDF) on 2014-07-15. ^ "The First Blood Transfusion?". Heart-valve-surgery.com. 2009-01-03. Retrieved 2010-02-09. ^ "This Month in Anesthesia History (archived)". Archived from the original on July 20, 2011. Retrieved 2016-03-05. ^ a b "Red Gold . Innovators & Pioneers . Jean-Baptiste Denis". PBS. Retrieved 2010-02-09. ^ Yale, Elizabeth (2015-04-22). "First Blood Transfusion: A History". JSTOR. Retrieved 22 April 2015. ^ Ellis, H. Surgical Anniversaries: James Blundell, pioneer of blood transfusion British Journal of Hospital Medicine, August 2007, Vol 68, No 8. ^ "Dr. William Lorenzo Moss". Archived from the original on 2014-02-28. Retrieved 2014-02-22. ^ a b Kim Pelis (2001). "Taking Credit: The Canadian Army Medical Corps and the British Conversion to Blood Transfusion in WWI". Journal of the History of Medicine and Allied Sciences. 56 (3): 238–277. doi:10.1093/jhmas/56.3.238. PMID 11552401. ^ "Red Gold: the Epic Story of Blood". PBS. ^ Susan Macqueen; Elizabeth Bruce; Faith Gibson (2012). The Great Ormond Street Hospital Manual of Children's Nursing Practices. John Wiley & Sons. p. 75. ISBN 978-1-118-27422-4. ^ "Percy Oliver". Red Gold: The Eipc Story of Blood. ^ Christopher D. Hillyer (2007). Blood Banking and Transfusion Medicine: Basic Principles & Practice. Elsevier Health Sciences. ISBN 978-0-443-06981-9. ^ Starr, D (1998). Blood: An Epic History of Medicine and Commerce. Little, Brown and company. pp. 84–87. ISBN 0 316 91146 1. ^ Sugita, Yoshiki; Simon, Ernest R. (1965). "The Mechanism of Action of Adenine in Red Cell Preservation*". Journal of Clinical Investigation. 44 (4): 629–642. doi:10.1172/JCI105176. ISSN 0021-9738. PMC 292538. PMID 14278179. ^ Simon, Ernest R.; Chapman, Robert G.; Finch, Clement A. (1962). "ADENINE IN RED CELL PRESERVATION*". Journal of Clinical Investigation. 41 (2): 351–359. doi:10.1172/JCI104489. ISSN 0021-9738. PMC 289233. PMID 14039291. ^ Laura Landro (2007-01-10). "New rules may shrink ranks of blood donors". Wall Street Journal. ^ WALD, MATTHEW L. (August 22, 2014). "Blood Industry Shrinks as Transfusions Decline". New York Times. Retrieved October 10, 2014. ^ "Red blood cell transfusions in newborn infants: Revised guidelines". Canadian Paediatric Society (CPS). Archived from the original on 2007-02-03. Retrieved 2007-02-02. ^ a b Cherkas, David (Nov 2011). "Traumatic Hemorrhagic Shock: Advances In Fluid Management". Emergency Medicine Practice. 13 (11). Archived from the original on 2012-01-18. The Chief Medical Officer's National Blood Transfusion Committee (c. 2008). "The appropriate use of group O RhD negative red cells" (PDF). National Health Service. Retrieved 25 July 2014. ^ Hillyer, Christopher D.; Shaz, Beth H.; Zimring, James C.; Abshire, Thomas C. (2009-06-09). Transfusion Medicine and Hemostasis: Clinical and Laboratory Aspects. Elsevier. p. 279. ISBN 9780080922300. ^ Goddard, A. F.; James, M. W.; McIntyre, A. S.; Scott, B. B.; British Society of Gastroenterology (2011). "Guidelines for the management of iron deficiency anaemia". Gut. 60 (10): 1309–16. doi:10.1136/gut.2010.228874. PMC 1728199. PMID 21561874. ^ Tshipe, Lerato (1 February 2017). "'Bluetooth' drug craze sweeps townships | IOL". Retrieved 2017-02-02 – via Pretoria News. Wikimedia Commons has media related to Blood transfusion. Transfusion Evidence Library searchable source of evidence for transfusion medicine. Handbook of Transfusion Medicine Free book published in the UK 5th edition. National Institute for Health and Care Excellence Blood Transfusion Guidance UK Guidance for transfusion. German Medical Association Guidelines (English), published 2014.